We’ve lost Maya Angelou the person, but not the beauty and wisdom she pinned down with words. If you need inspiration today, let her descriptions of the writing life lift you up. When I am writing, I am trying to find out who I am, who we are, what we’re capable of, how we feel, how we lose and stand up, and go on from darkness into darkness. I’m trying for that. But I’m also trying for the language. I’m trying to see how it can really sound. I really love language. I love it for what it does for us, how it allows us to explain the pain and the glory, the nuances and delicacies of our existence. And then it allows us to laugh, allows us to show wit. Real wit is shown in language. We need language. Some day we’ll be able to measure the power of words. I think they are things. They get on the walls. They get in your wallpaper. They get in your rugs, in your upholstery, and your clothes, and finally in to you. I would be a liar, a hypocrite, or a fool — and I’m not any of those — to say that I don’t write for the reader. I do. But for the reader who hears, who really will work at it, going behind what I seem to say. So I write for myself and that reader who will pay the dues. To take a few nouns, and a few pronouns, and adverbs and adjectives, and put them together, ball them up, and throw them against the wall to make them bounce. That’s what Norman Mailer did. That’s what James Baldwin did, and Joan Didion did, and that’s what I do — that’s what I mean to do. I don’t think there’s such a thing as autobiographical fiction. If I say it happened, it happened, even if only in my mind. I promised myself that I would write as well as I can, tell the truth, not to tell everything I know, but to make sure that everything I tell is true, as I understand it. The best candy shop a child can be left alone in is the library. We write for the same reason that we walk, talk, climb mountains or swim the oceans — because we can. We have some impulse within us that makes us want to explain ourselves to other human beings. That’s why we paint, that’s why we dare to love someone — because we have the impulse to explain who we are. Not just how tall we are, or thin… but who we are internally… perhaps even spiritually. There’s something, which impels us to show our inner-souls. The more courageous we are, the more we succeed in explaining what we know. 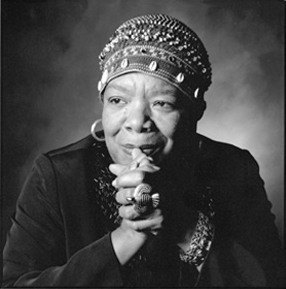 Learn more about Dr. Angelou’s remarkable life in the New York Times, or see how other bloggers are remembering her in the Maya Angelou topic in the Reader — we particularly love these pieces from Black Millennial Musings and All at once…. I love her quotes. Thank you so much for sharing. May her soul rest in peace! Very nice…thank you for this post. Her voice was soothing and powerful at the same time. Loved her voice. Loved her words. Thanks for putting some of her words here for us to read today in her memory. One of the best quotes I’ve ever heard! In and Out of Time was my favorite work of hers. Love her! That’s beautiful — thanks for sharing it, we’ll be featuring it on Freshly Pressed later today. Amazing! thanks for sharing a piece like this..
Oh my gosh, I love this post. Her words are so inspiring. If anything gets me back to my memoir, it will be this post. THANK YOU! I love that quote about the library as a candy shop. The library certainly is a candy shop…I find a book for everyone of my interest(tastes), so true! Maya Angelou inspired not only the writer in me; but also the woman, the human being and spirit. I love Maya Angelou. She’s a great inspiration for black women writers like myself. Thanks for sharing her quotes. I love the 6th one about measuring the power of words… Such a remarkable woman. An extraordinary woman. I have admired her work as a writer and her humanity as a person for many years. Though her physical body is gone we are blessed to have her words remain with us for an eternity. May she rest in peace. Same here – for the first time. Very inspirational. I will miss Angelou terribly. Her love of words and her poetry is absolutely beautiful. And this quote is encouragement for me and hopefully for other writers as well. I write for the reader and for myself equally, either way it is my kind of truth. I love her other quotes too, especially the ones dealing with writing as a fundamental part of life. Thank you for this–she was such a beautiful soul and an inspiration for all of us. So beautifully said: writing is a way to show our inner souls and it really does take courage. Ms. Angelou certainly displayed that courage. My condolences to her friends and family. Simply the best… in thought, delivery, and longevity. She didn’t write to inform or impress us; she wrote to impact us, to impact a community and finally to impact the world. I will miss seeing her in living form; but I am glad to know that her words will outlive her…and continue doing what it has! “People will forget what you said, people will forget what you did, but people will never forget how you made them feel”. We will never forget you Maya Angelou. RIP, the world will remember. There’s Still Time to Join Writing 101!